What does it all mean? The Aroon Oscillator is a measure of trend strength and can be applied to any asset, including stocks, forex and commodities. The Aroon Oscillator can be applied to any time frame, from intraday to weekly or monthly periods. The Aroon Oscillator can be used to generate trade signals, or can be used to support use of trend or momentum indicators. Readings above zero indicate an uptrend, values below zero indicate a downtrend and values around zero suggest a consolidation period. How does it Work? The Aroon Oscillator is calculated as the difference between the Aroon-Up and the Aroon- Down over a defined period, usually between 10 and 25 days, with the 25-day setting the most common. The Aroon Oscillator is bound by a range of +100 to -100 and can quickly move from one extreme to the other. The Aroon-Up and Aroon-Down measure the number of periods since price recorded an x-day high or low and both are used as an indicator in their own right. The closer the Aroon Oscillator is to +100, the stronger the uptrend and vice versa, the closer the Aroon Oscillator is to -100, the stronger the downtrend. An Aroon Oscillator moving between -40 to +40 favours a consolidation in price action – in effect, the further away the Aroon Oscillator is from the zero line, the stronger the trend. 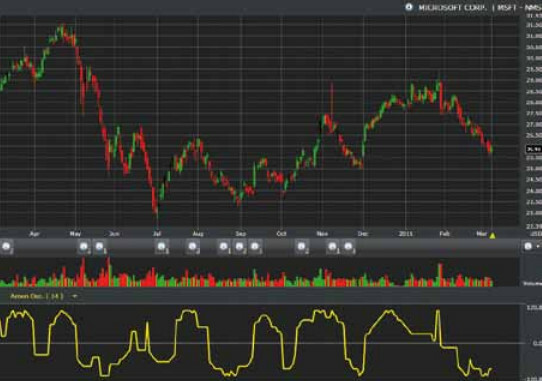 The Microsoft chart above shows how trend strength shifted dramatically to bears on February 10th 2011 as the Aroon Oscillator fell from a February 9th value of -14.29 to -71.43 as Microsoft traded at support of $27.50. The strength of the current decline is emphasised by the failure of the Aroon Oscillator to climb above -50 since the break of $27.50. So what are the signals to look for? A cross of the zero line can be used as a trade trigger; buy when the oscillator moves from negative to positive, sell when the oscillator moves from positive to negative. There are also opportunities to take advantage of divergences – although not all technicians agree the Aroon Oscillator is well suited to divergence spotting. For example, one can look to the bullish divergence occurred in Microsoft last July when a new reaction low in price was not confirmed by the Aroon Oscillator, which instead ‘stepped up’ from the previous June low. Bullish strength extended to September, this time a positive divergence formed when price failed to undercut the July low, as the Aroon Oscillator extended to its minimum -100, further suggesting a reversal. When do I make my move? The Aroon Oscillator can be used as a ‘controller switch’ for other technical indicators. When the Aroon Oscillator is extended towards -100 or +100, trend indicators like moving averages are best employed (e.g. a price cross of a moving average). But when the Aroon Oscillator is bound between -50 to +50, momentum indicators like stochastics or relative strength can be used for trade signals. By using the Aroon Oscillator in this fashion it maximises the effectiveness of respective trend and momentum indicators. It may be necessary to adapt the Aroon Oscillator to suit your requirements. For example, combining the Aroon Oscillator with other technicals might best employ a long period setting on the Aroon Oscillator, combined with shorter period momentum and trend indicators – the long period Aroon Oscillator acting as the filter for the more frequent signal generating short period indicators. Whipsaws on crosses of the zero-line are not unusual. Traders using the crossover as a trade signal may find it necessary to apply a time filter to ensure the Aroon Oscillator can hold the crossover. Again referring to the Microsoft chart, the June 15th 2010 zero-line crossover was one such whipsaw signal. Using a typical Aroon Oscillator setting of 25- days can lead to a signal lag, crossing the zero-line well after the new trend is underway. Because of this, the Aroon Oscillator does not pick out bottoms or tops, but instead looks for strong trending environments which allow you to trade with the trend.